"This is a pan seared tuna dish that is best served with grated carrots." 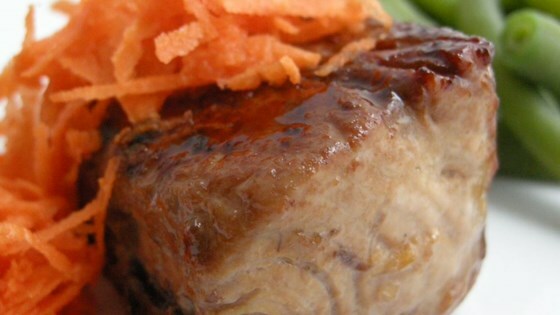 Pour the teriyaki sauce into a shallow dish or bowl, and place tuna steaks in the sauce to marinate. Cover, and allow to marinate for about 45 minutes at room temperature. The steaks will cook more evenly if they are not cold. Heat olive oil in a large skillet over medium heat. Place tuna steaks in the hot oil, and pour in the teriyaki sauce. Squeeze juice from the lemon over the steaks, and sprinkle with sesame seeds. When the bottom is light brown, flip the steaks, and cook until browned on the other side. The center will still be slightly red. Season with sea salt and pepper. Place the tuna steaks onto serving plates, and garnish with grated carrots. Serve the pan drippings as a dipping sauce. Make spicy tuna cakes using basic ingredients commonly found in the pantry. Didn't add extra salt and it was still really salty. Kind of bland. Not trying this one again. Excellent and very easy to prepare. Buy a high quality teriyaki sauce, as that is what will make or break this recipe. I was out of lemons so I substituted orange juice. Delicious! This was very good. I made extra sauce and drizzled over steamed vegetables. I served with Seasoned Couscous recipe from this site. We will make again. I'm NOT a cook, but this was easy and delicious. I was very impressed that I made something that tasted that good!! Thanks for the recipe..